Tangy, juicy citrus fruits are an important part of many recipes and beverages. 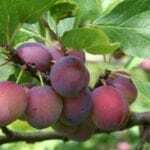 Home growers know the trees that bear these delicious fruits are often prey to diseases and many pest problems. Citrus thrips are one of the most common and are considered a threat to commercial production. There may be other types of thrips on citrus trees, but this variety has the potential to cause the most economic damage. For this reason, control of citrus thrips is vital in areas where wide scale production of citrus fruit is common. 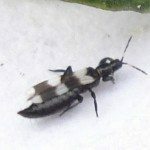 What are citrus thrips? They are tiny orange-yellow insects whose feeding activities scar and damage the surface of the fruit. It is important to know what citrus thrips look like, as there are other thrip pests on citrus trees, which do little damage to the fruit and require no treatment. Citrus thrip coloring resembles the fruits upon which they dine. The body is oval and pointed with six hairy legs and fine hairs over the whole insect. They are only .6 to .88 millimeters in size and have four instars. The second instar does the most damage, as they feed on the tiny new fruits. 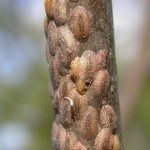 These insects produce up to eight generations in one year, so monitor your trees carefully and watch for citrus thrips symptoms. The insects feed on the fruit buds and puncture the cells in the rind. This causes scarring and scabs. The appearance of the damage includes silvery or whitish trails, which grow larger as the fruit grows. The early scars turn into rings of damaged tissue on mature fruit. While this does not harm flavor or texture of the pulp and juice, the marred exterior makes it appear unpalatable. This is more important in commercial production, where buyers expect perfect looking fruit. Thrips on citrus trees can spread to commercial orchards, so management of dooryard trees is important to preserve industry production. Damage can occur to fruit from petal fall until the citrus is 1 1/2 inches wide. The insect’s feeding also damages young leaves, which may defoliate over time. Control of citrus thrips must begin early in the season. For this reason, you need to be prepared and know how to treat citrus thrip pests. Do not use broad-spectrum pesticides in your landscape, as these can kill the natural enemies of citrus thrips. Studies have also shown that populations of citrus thrips actually increase the season after spraying with such products. Try using non-chemical methods or specific formulas for thrips to avoid such population explosions. Organically grown trees treated with Spinosad early in spring show few signs of the pests. 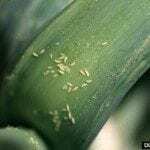 There are also chemicals used to combat thrips, but they tend to develop resistance quickly. With eight generations each year to deal with, that adds up to a losing battle. However, some formulas of chemical control of thrips will work against pests. Pyrethroids and organophosphates have relatively non-toxic control.